There are currently 7 tools available with more instruments to come in future updates. Scroll down to learn more about each one. Measure straight lines on any surface, such as a desk or wall. Ruler automatically attaches to detected horizontal and vertical planes for better accuracy. Using Chaining Mode, you can quickly link together multiple rulers in one measuring session and see floor area, as well as total distance. Measuring your room has never been easier. Trajectory tool in MeasureKit records precise device motion and shows movement trajectory line on the screen. Final distance and intermediate points are available too. This tool is most useful for measuring curved objects or length of a path, for example. And it's just incredibly fun to play around with. Another way to measure distances is to use Marker Pin tool. Simply tap on the screen to place a marker somewhere in the world and as you move around, you can always see current distance from the device to the marker you pinned. You can measure with multiple markers at the same time. It's an accurate and easy way to measure something in your home or across the street. You may not need a tool for measuring angles every day, but it's always good to have it in your measuring toolbox. Also called protractor, with just three taps you can use this tool to quickly measure any angle and get the result in degrees. Want to know how tall someone is? MeasureKit has a special tool for that too. 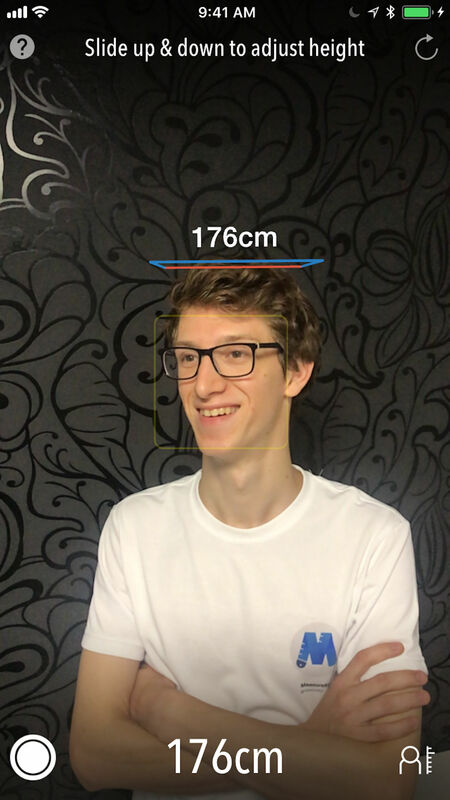 Simply detect the floor where the person is standing, point your camera at their face, and you'll see resulting height above the head. Children grow so fast and it's fun to track their height change over time. As with any tool, you can tap the shutter button to capture the image and save it to your photo album or share with friends. This is something different. Cube tool allows you to visualize how much space some object is going to take. 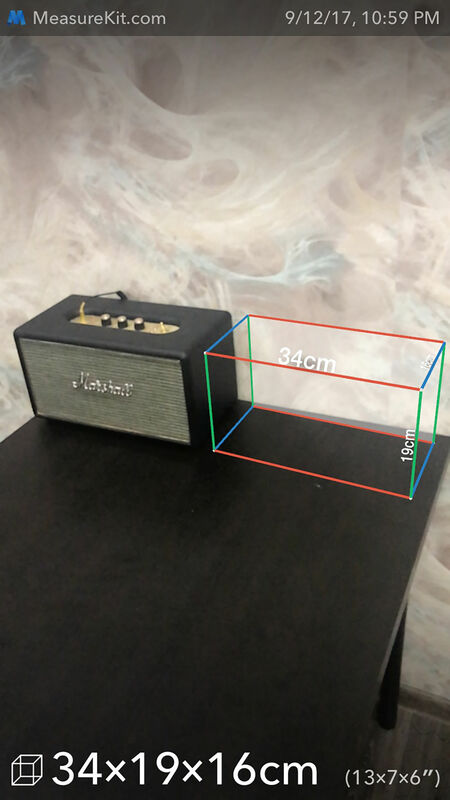 Set specific dimensions (either by scaling it with two fingers or using precise size controls), place it somewhere in the world, and see how it fits. Cube automatically attaches to surfaces detected in the world around you. You can rotate it, move it around, and change size however you want. And you no longer need to move a heavy cupboard or sofa across the room to see how it will fit. Ever wondered if this picture you're about to hang is perfectly aligned? There's a simple tool in MeasureKit which solves exactly this problem. Just tap on the screen and virtual level appears in your augmented world. Three colorful lines indicate three axes for alignment — vertical, horizontal, and a depth axis. MeasureKit features multiple custom internal algorithms for understanding the world around you. You can see the effects yourself by enabling Vision Visualization Mode in app settings. This results in really smooth and accurate measuring experience, including on walls and other vertical planes. 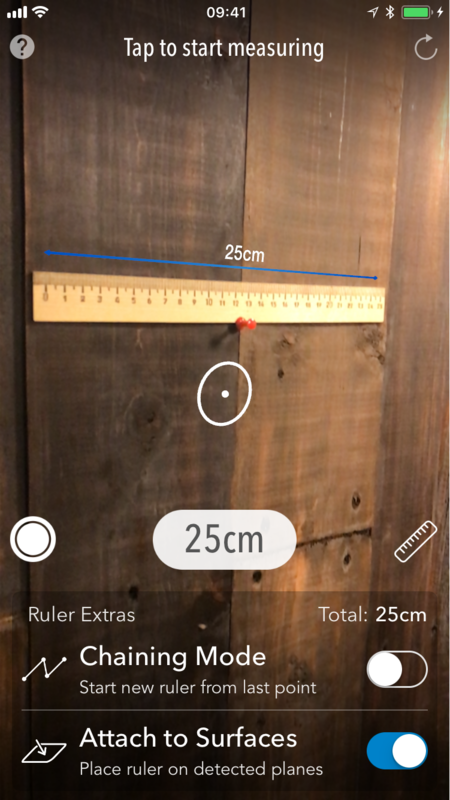 While most similar AR ruler apps are limited to measuring accurately only on a desk & floor, with MeasureKit you can easily measure a painting on your wall, for example. MeasureKit is available on the App Store for your iPhone and iPad with iOS 11. You get all tools with one-time purchase for $4.99.